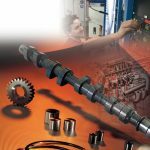 The DEBURRING process allows parts to perform as they were designed to, eliminating unwanted elements that hinder their productivity. 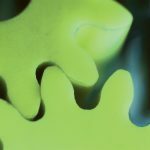 Gear deburring is a process that has changed substantially over the past 10 years. 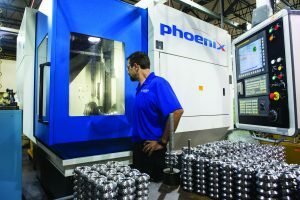 There have been advancements in the types of tools used for deburring operations and the development of “wet” machines, automatic load and unload, automatic part transfer and turnover, and vision systems for part identification, etc. There are many wheel grits available, from 320 grit for small burrs and light chamfers, to 57 grit for large burrs and heavy chamfers, with numerous grit sizes in between. 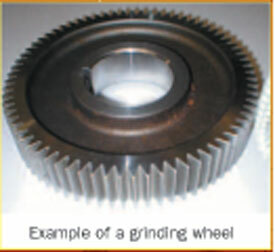 Grinding wheels will usually provide the required cosmetic appearance for a deburred gear. 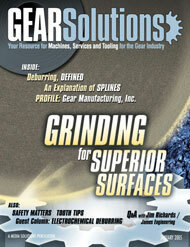 Setting up the grinding wheel is critical for good wheel life and consistent chamfers. 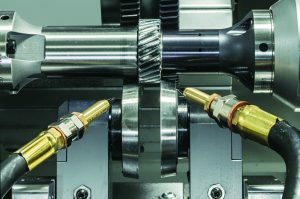 The point of contact for the grinding wheel should be equal to the approach angle of the grinding head. 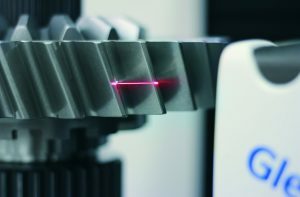 For example, set a 45° approach angle for the grinding head with a protractor. Next, draw a line through the center of the grinding wheel followed by a line drawn 45° to the first line. 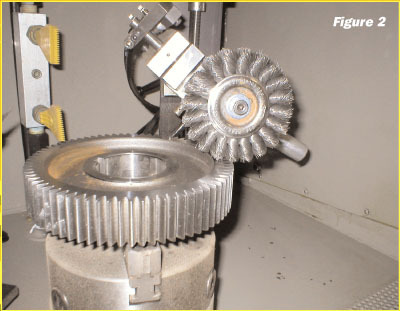 The contact point between the gear and the grinding wheel should be at the 45° line (see Figure 1, which shows a gear deburred with a grinding wheel). 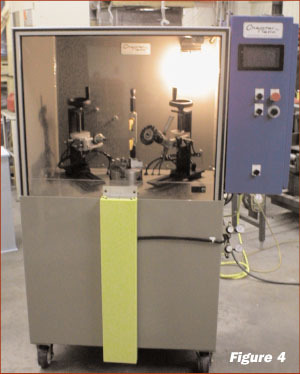 This setup will result in optimum performance of the grinding wheel. 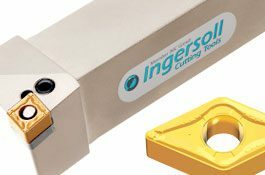 The size of the chamfer attainable is determined by the size of the burr to be removed from the part. 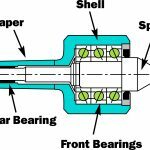 Further, three additional factors that affect chamfer size are wheel grit size, speed of the work spindle, and the amount of pressure applied to the part by the grinding wheel. Grinding wheel speed is noted on the grinding wheel, and it is usually 15,000 to 18,000 RPM. 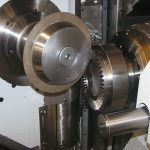 The grinding wheels used most often are aluminum oxide. 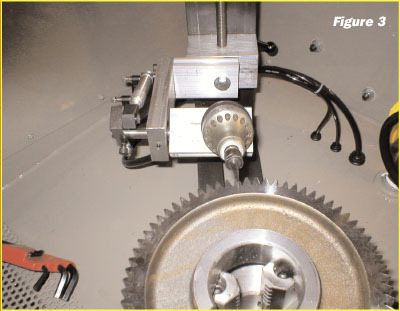 Parts with small burrs can be effectively deburred with a brush (see Figure 2). Two types of brushes are used for deburring operations, those being wire and nylon. Wire brushes are made with straight, crimped, or knotted bristles. 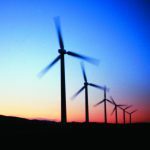 The wire diameter and length will determine how aggressively the brush will deburr. Nylon brushes can be impregnated with either aluminum oxide or silicon carbide, with grit size ranging from 80 to 400. 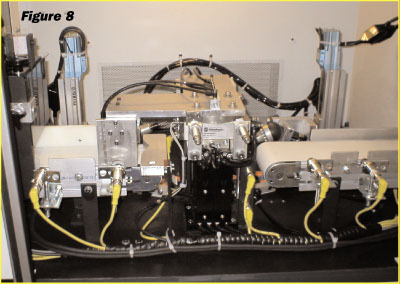 The specific application will determine which type of brush is required. 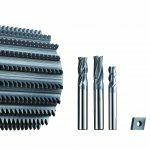 In applications where a heavy burr is to be removed with a grinding wheel or carbide tool, a brush is often used as a secondary process for removing small burrs created by the first process. 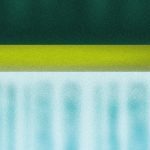 • Reduced deburring time. 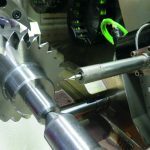 The carbide tools can run at 40,000 RPM, vs. 15,000 to 18,000 RPM for grinding wheels. 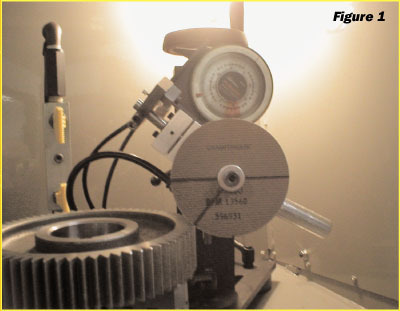 • Reduced setup time, because there is no need to establish an approach angle as with a grinding wheel (see Figure 3). 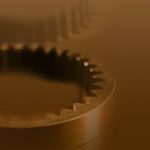 • Ability to deburr cluster gears, or gears having the root of the tooth close to the gear shaft or hub. 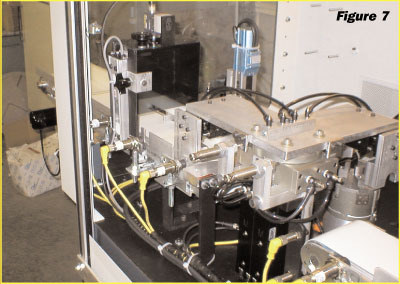 The deburring process is accomplished with floating-style deburring heads having variable RPM air motors or turbines. 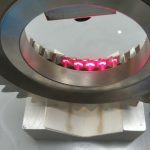 The floating heads have air-operated, adjustable counterweights for adjusting the pressure applied to the part being deburred. The dry machine is so named because the deburring operation is performed dry. 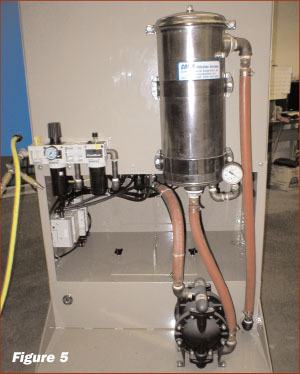 Usually, these machines are equipped with a dust collection system. 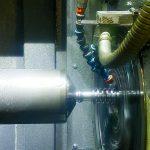 Deburring on a dry machine is best accomplished if the parts are clean and dry prior to deburring. 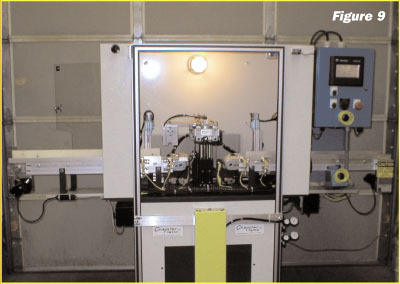 With a wet machine, a non-foaming rust preventative is applied to the part during the deburring process (seeFigure 4). 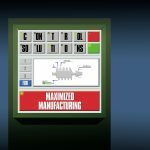 In addition to increased productivity, the flexibility provided by these automation devices permits efficient processing of a variety of parts through one machine because change-over from one part to another is not complicated and can be done quickly. 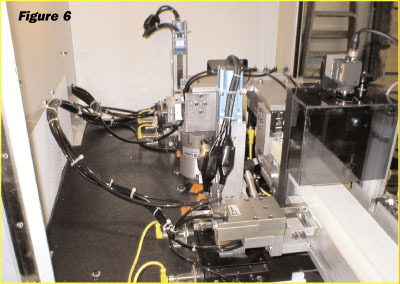 Therefore, one machine with automation can efficiently deburr a number of parts, reducing the need for multiple machines (see Figure 8 and Figure 9). 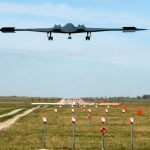 is president and owner of Machesney Park, Illinois-based Chamfermatic, Inc. He can be reached at (815) 636-5082 or chamfer96@comcast.net.